Have you got an ORCID identifier yet? You should. They’re on the rise – and for good reason. An ORCID iD is a number (mine is 0000-0002-0552-8870) that unambiguously and persistently identifies you in the digital world of academia. It ensures that your research activities, outputs, and affiliations can be easily and correctly connected to you. They are currently used by over 200 research and workflow platforms to identify and connect researchers with their grants and papers, at universities and research institutions, at funding agencies, and at publishers. Around the world over 1.8 million researchers have registered for an iD, many in the hope that it will enhance their digital discoverability and reduce their reporting paperwork. Several funders have started to require ORCID iDs as part of the grant proposal process. 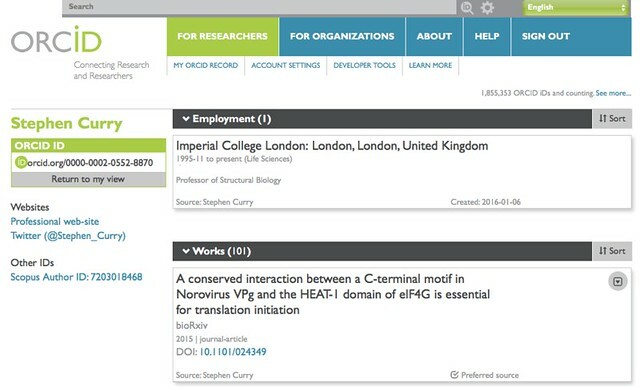 In the UK, the Wellcome Trust and the NIHR both do, and ORCID IDs are being integrated with Researchfish, the system used by the Research Councils to track grant outputs. Universities are getting in on the act too. In 2014 my own institution, Imperial College, a created ORCID iDs for every member of staff who didn’t already have one, unless they opted out. Very few did so. The number of publishers using ORCIDs is also on the rise. Today a group of eight publishers have announced that, beginning in 2016, they will require authors to use an ORCID identifier (iD) during the publication process. These are AAAS (publishers of the Science stable of journals), American Geophysical Union (AGU), eLife, EMBO, Hindawi, the Institute of Electrical & Electronics Engineers (IEEE), the Public Library of Science (PLOS) and the Royal Society. The Royal Society has been quickest off the mark, making ORCID iDs a requirement for authors as of new year’s day. The rest will follow suit at various dates throughout 2016. With luck, this move with spur other publishers soon to join in. In a digital world ORCID iDs make a great deal of sense. Their adoption by institutions and publishers fulfils two of the recommendations made in The Metric Tide, last year’s report of the Independent Review of the Role of Metrics Research Assessment and Management (of which I was a co-author). If we are going to track outputs, we might as well do it systematically and efficiently. I look forward to the day when interacting with Researchfish will be trivial rather than tedious, as at present. In theory, ORCID IDs might even reduce away some of the burden of the ever-unpopular Research Excellence Framework (REF) – though of course we shall have to await the outcome of the government’s re-jigging of HEFCE and the Research Councils before the contours of the next REF become clear. I wouldn’t hold my breath. Of course by automating the digital tracking of inputs and outputs of ORCID iDs raises the risks associated with unthinking uses of metrics – something that The Metric Tide was keen to warn against. On that front we need to remain vigilant. But on a personal level, most of us want to be recognised for our work and have an interest in making sure that our published outputs are recorded accurately. The ORCID system also provides handy way of keeping track of your published work. Thanks to the good offices of Europe Pubmed Central, you can use your ORCID iD to follow the open citations to your work. Here, in the interests of transparency, are mine: https://europepmc.org/authors/0000-0002-0552-8870. The profile is perhaps not as complete as that provided through Google Scholar but it is at least open. If you want an ORCID iD of your own, simply sign up and use the tools to identify yourself and your work (papers, conference proceedings, patents – anything). You can also add your grants, and your education & employment history. For all of the information entered, it’s up to you how much to make publicly visible. Update (2015-01-07, 14:02): This post was modified to mention the fact that the AAAS will also be requiring ODID iDs in 2016. This entry was posted in Academic publishing. Bookmark the permalink. JMIR Publications has mandatory ORCIDs since 2014 – see http://www.jmir.org/about/submissions#authorGuidelines. Good to know that other publishers are catching up. I’ve got one (0000-0003-1987-1095). Only one publication I’ve ever submitted has asked for it, and that paper (http://www.nature.com/gim/journal/v17/n9/fig_tab/gim2014178f2.html) doesn’t show up at orcid.org/0000-0003-1987-1095, so I’m not sure what the point of using it was. Although I am a fan of the concept (particularly in that it should disambiguate people with identical names), I’m not sold on the implementation so far. Do I have to go back and somehow associate existing publications with it? Why should I have to? etc. I think, at least initially, you are the one who has to verify your publications (especially for those published pre-ORCID) but I found this relatively easy using the tools provided. Ultimately you would think that the use of ORCID iDs by publishers should mean that your records are updated automatically. Wow. I just tried to do this and there is no option to import from PubMed. Adding manually, I give it a PubMed ID and it still asks me to manually enter what kind of “work” it is, a category (what? ), AND enter the title… manually! If they’re not going to automate the process, or make it dead easy to work with the most-used repository of (admittedly, biomedically-focused) science citations, what on earth is the point? Having said that, importing from “Europe PubMed Central” worked fine. But really, now. From the “+Add Works” button, I have used the “Search and link” tools, specifically the “Scopus to ORCID” option to find and add my papers. I didn’t find it too tricky. Is that option open to you. Scoops is an Elsevier product so maybe not available to all comers? Didn’t try that, but after my rant, the Europe PubMed Central import was both simple and seamless. But srsly, speaking as a journal editor, ORCIDs should make life a lot easier, notwithstanding inasmuch as which the disambiguation to which Winty refers. When one is searching for a referee, or tracing the publishing history of an author, distinguishing between all the John Smiths and Qi Wangs of the world can be a very time-consuming process.